We have truly kicked off the first three months of the New Year in style. Our show-stopper dessert course helped customers learn how to present beautiful sweets and learn a few tricks of the trade from our very own Chefs. The second Caremoor for Exmoor – Gin and Exmoor Taster Menu, with an amazing 5 course menu celebrating the beautiful produce of Exmoor in all of its glory. With expertly paired gins to complement each course. On Thursday 28th March, we teamed up with local florist The Orange Pip who taught customers how to make a fresh flower posy, an ideal present for mother’s day. Along with Genius Events we hosted our first comedy night of the year on the 30th March, our fantastic acts including our headline act Steve Bugeja succeeded in bringing great comedy to Minehead. We will be hosting our next one in June so keep an eye out for more information! “Yesterday we were lucky enough to enjoy a delightful lunch at the Beach Hotel, Minehead. The food was outstanding, delightfully presented and full of lovely flavours. The Beach Hotel is run by the YMCA with employees of mixed ability. Everyone performed their jobs to perfection, it was a real treat. So what events do we have next? 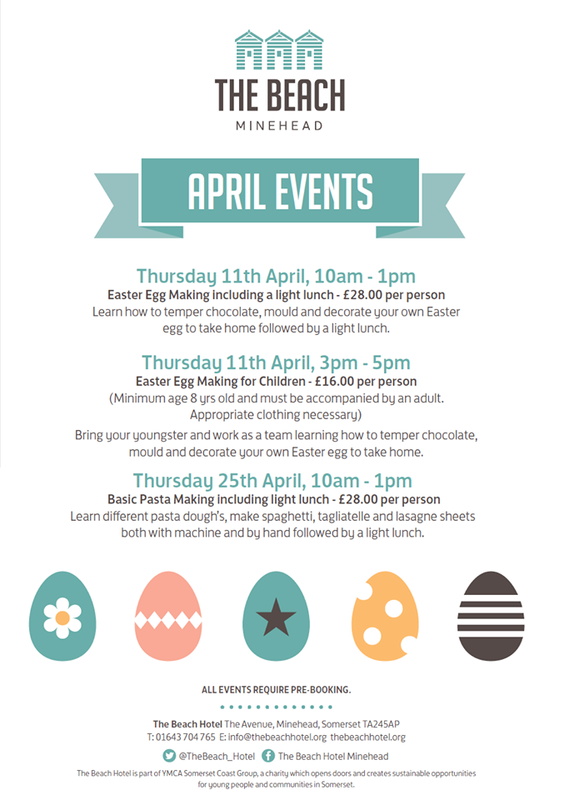 The next event is on Thursday 11th April where we have a class in Easter Egg Making run by our wonderful kitchen team. They will be teaching you how to temper chocolate, mould and decorate your own Easter Egg. The first class is adults only from 10am -1pm including a light lunch in our award winning restaurant. Our 3pm class is specifically for children (8 and above, must be accompanied by an adult) which is Egg-cellent activity for the Easter Holidays! We also have a Basic Pasta Making course on the 25th April from 10am-1pm including a light lunch. Throughout the course you will learn how to make homemade spaghetti, tagliatelle and lasagne sheets, both by hand and machine. A great opportunity to learn a new skill and advance your culinary experience. If you would like to book on any of these courses please do not hesitate and call our friendly reception team on 01643 704765.